With things not going well for the Mayor and TfL on the railway front, they could have probably obtained some solace in the thought that the Mayor’s ambitious Healthy Streets policy was making good progress. Unfortunately, a first blow has been dealt by the City of Westminster with their about-turn on the planned pedestrianisation of Oxford Street. We now look at a further potential setback following a judicial review (JR) hearing brought the City of Westminster. 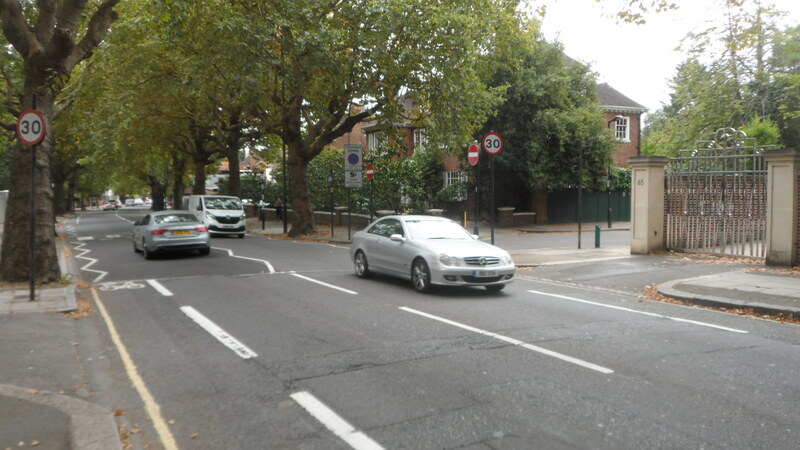 This challenged the Mayor’s Cycle Superhighway 11 (CS11) scheme. As a consequence of this challenge, construction has already been delayed. A judicial review takes place when the lawfulness of an executive or legislative body is called into question. We have covered a judicial review once before. On that occasion it was a case brought by the London Borough of Enfield against the DfT. At issue was the Invitation to Tender document for the West Anglia franchise and the failure for it to specify a requirement for 4tph at Meridian Water station – something the London Borough of Enfield was relying on and believed that the DfT had promised would happen. Sometimes JRs can be extremely enlightening of the issues raised or of the procedures involved affecting those issues. On other occasions, they can appear extremely obscure and devoid of relevance. One of the reasons that JRs are disliked by those on the receiving end is that they are potentially extremely disruptive and divert effort away from the task in hand. Another reason is that, however confident one feels that the JR is without merit, there is always the slight risk that something new and unwelcome is brought to light during the proceedings or simply that the judgment goes against expectations. These same reasons are why they can be seen as a weapon of choice – the ultimate weapon of legal mass destruction – by those who initiate them. Even an ultimately unsuccessful JR can thwart or delay a proposed project. For this reason, the courts tend to require an initial hearing to establish whether there is an arguable case to be made or whether it is considered that the application is largely vexatious and unlikely to succeed. Arguably, one good thing about JRs is that they make potentially affected bodies careful about doing things properly so that any potential JR will fail. This tends to lead to accountability and good quality governance at the expense of slowing the pace of decision-making and enacting those decisions. 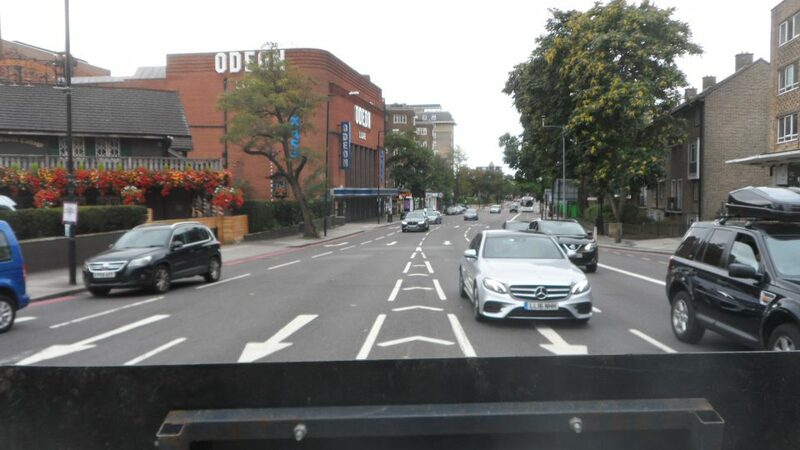 It must have come as a bit of a surprise for TfL when the City of Westminster decided to challenge their implementation of CS11 in the courts. Far more contentious schemes have already been introduced, including the East-West Cycle Superhighway which runs along the Embankment and is largely in the City of Westminster. TfL must have been aware of the possibility of a JR in the case of CS11 because, apparently, the top risk in failing to complete on time was considered to be the possibility of a JR. Nevertheless, the fact that the risk was identified would suggest that TfL would have ensured that grounds for such a review were mitigated against. What we don’t know is whether TfL had any particular body in mind that would initiate such a review. It could be that they thought their primary threat came from the London Taxi Drivers Association (LTDA) who have a past record of both initiating JRs for road schemes they don’t like and of threatening to initiate such proceedings even if the threat is not carried out. One of the big questions must be: why would the City of Westminster seek a JR? This question is further complicated by the fact that there are both official reasons for this and an apparent unofficial agenda that may give insight to the real reasons for this case being brought. For the moment we will restrict ourselves to former. The irony of increased air pollution as an objection to a scheme designed to encourage cycling and reduce motor vehicle traffic has not been lost on many, who regard the application for the review with some incredulity. The scheme itself is not a particularly big one as Cycle Superhighways go, although there are plans for it to be extended northward in future. It is planned to run from Swiss Cottage to Portland Place (outside Broadcasting House just north of Regent Street). In doing so, a considerable part of the route is in Regent’s Park which is a Royal Park. The idea is not just to make a safer cycling route, but also a more pleasant one. Starting at the north end, the route begins at the one-way system at Swiss Cottage. This is currently one of the most cycle-unfriendly junctions in London and is quite dangerous for cyclists. TfL want to change this to a two-way system and, in doing so, include good cycle provision. This is regarded as a critical part of the scheme, as without it the route not be attractive to (or safe for) cyclists. Without the work at Swiss Cottage there would be little point in implementing the rest of the scheme. It should be noted that the Swiss Cottage one-way system is entirely within the London Borough of Camden. From Swiss Cottage, the plan is for CS11 to continue in a south-eastern direction along a ‘B’ road (Avenue Road) in order to reach one of the entrances to Regent’s Park. The speed limit on entering Avenue Road just south of Swiss Cottage drops to 20mph, though is not universally observed along this wide road. 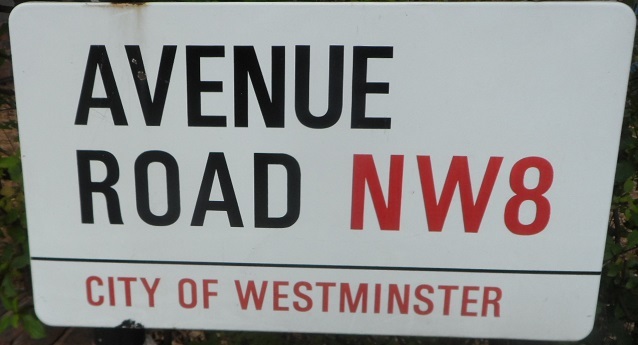 Further down, Avenue Road crosses the borough boundary to leave Camden and enter the City of Westminster. The boundary is made obvious by an otherwise inexplicable change of speed limit from 20mph to 30mph. It goes along the Westminster part of Avenue Road for about 600m which is slightly less than the distance from Swiss Cottage Tube station at the north end of Avenue Road to the borough boundary. In other words, the majority of the road, by a small margin is in the London Borough of Camden. It should be noted that Camden is probably the most cycle-friendly London borough. 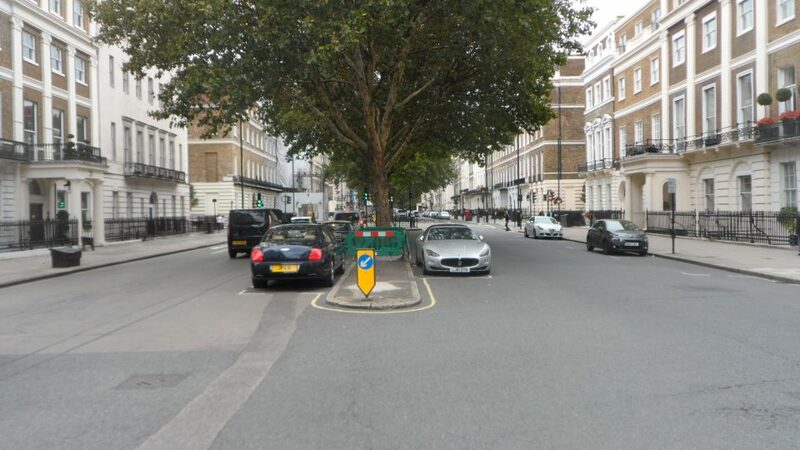 The City of Westminster is not the most cycle-unfriendly, but it is known to have considerable reservations about various aspects of some cycle-schemes and its support cannot be taken for granted. The next stage of this short cycle superhighway is planned to utilise the Outer Circle road with Regent’s Park. This would appear to be eminently sensible and logical and it makes the cyclist’s journey a more pleasant one. Notably, it also potentially keeps cyclists away from areas of low air quality. As was the case with the East-West Cycle Superhighway through St James’s Park and Hyde Park (covered in part 2 of Bike to the future) the big complication is that the Mayor is not in charge of the Royal Parks in London. 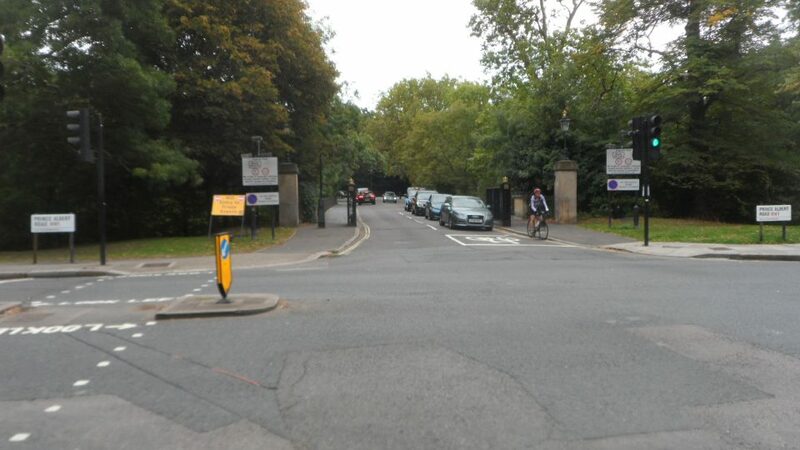 The plan is to restrict motor vehicles entering and exiting the North Gate of Regent’s Park except between 11:00 and 15:00 to make the cycle superhighway more pleasant for its users. This will mean that motor traffic will have to use streets outside the park rather than take a convenient shortcut through it. The effect of closing the gates to vehicular traffic is to divert traffic elsewhere. Most of the traffic along Avenue Road currently originates from, or continues through, the North Gate of the park, so it would be expected that during the hours of gate closure most regular motorists would no longer use Avenue Road. This would make that road more pleasant for cycling. Note that providing a traffic shortcut is not really what the Royal Parks were intended for. There have been previous cases of traffic subsequently being banned. The most notable examples are along the Mall on Sundays and throughout Greenwich Park for part of the working day and all of the weekend. 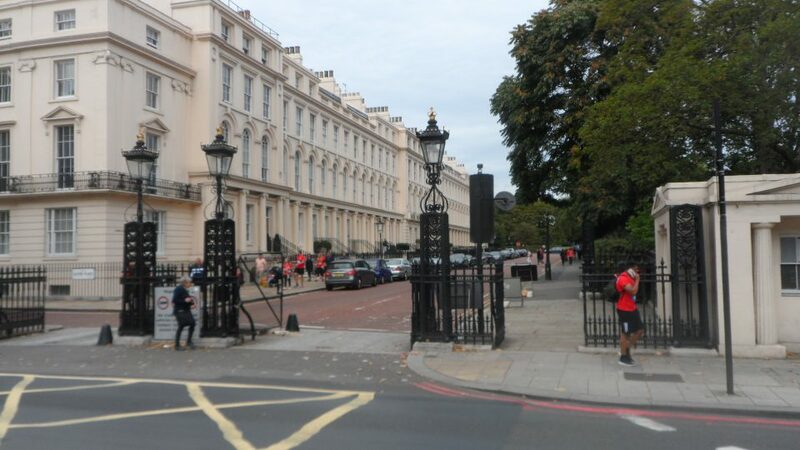 Once through the park, the next major part of CS11 is the east-west running Euston Road which cyclists will need to cross in the vicinity of Regents Park or Great Portland Street Tube stations. Euston Road is a TfL road in the City of Westminster. A cycle-only phase on the traffic lights, which is considered necessary, will potentially reduce capacity along Euston Road.